Ah, Paris! Picture yourself on a sun-bathed terrace in the City of Love with a glass of rosé in hand. Is there any better way to spend your summer evening? It’s a cliché, but it’s definitely true. But these days, Paris is so much more than that. There’s a wave of renewal and what better time to explore than on a beautiful summer day? Set aside your glass of rosé, put on some summer-appropriate clothes and discover Paris with our local Spotters. We’ve made the perfect selection to fill up your day! Still, my most colorful and artistic discovery to date has to be the TEP Duperré, just by the metro station Pigalle. 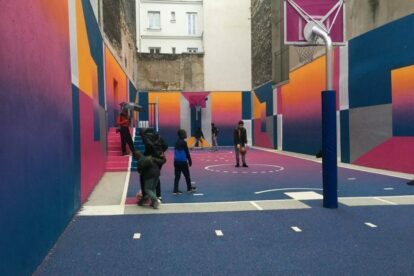 This compact basketball court may look like some neatly-executed street art to passersby, but it is a free playground for both children and adults. “I know this place! It used to be a graffiti-covered abandoned building that held incredible parties when I was still at school”, chipped in a friend of mine when I arranged to meet him at the Piscine Molitor for a coffee. 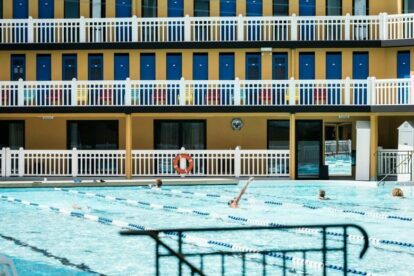 Molitor was once one of Paris’ most popular pools, but its past is now colored by its closure in 1989, after which it became the haunt of artists and a hot spot for underground parties. Being a listed building, it was never demolished and remained abandoned until its transformation into a hotel/spa/restaurant in 2014. As the warmer months arrive, Parisians will flock for a dip in the outdoor pool, but even if you’re not a keen swimmer, there are plenty of other reasons for you to check out this spot. Its spa is open to the public as well as to hotel guests (for a handsome price). The open balconies of yellow and blue cabins circling around it provide a vintage feel and are in line with the original design. You can also wander through the Brasserie Urbaine to the cafe and enjoy a coffee on the poolside terrace. On your way through their corridors, check out the photos of the Molitor from its graffiti-adorned glory days! As time goes by, I am getting more and more concerned with what I eat and where the food comes from. That’s why I am a big fan of Altervojo, a small shop where maybe 90% products come from France, all grown in a very ethical and organic way. The owner is very nice, always kind and willing to talk about the product or producers, picked carefully by him. He’s also full of good advice regarding recipes with veggies or fruits you don’t know yet! 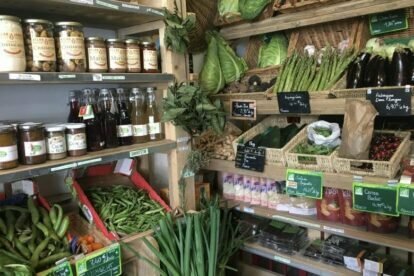 In the shop you can find of course seasonal vegetables and fruits, tea, bread (gluten-free or not) and cakes – small portions, perfect to eat while going home – and everything you may need to cook or bake something! 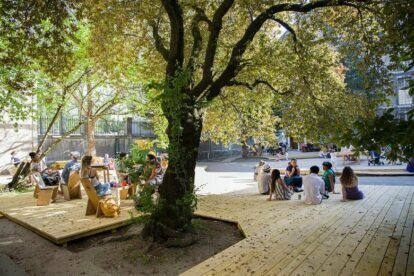 One of our local garden spaces, Jardin de la Folie, remains open so it’s worth a visit even if the temperatures are falling, especially if you’re around and about in the 11th neighboorhood. And even if the grassy area is fenced off for its annual grooming during the winter months, there remains plenty of benches where you can chill for a while. The word ‘folie’ is worth a short explanation. The ‘folie’ in this case is probably in reference to the tiny size of the garden’s biodiverse space which contains a lilypond and herb garden. And folie translates to ‘mad’. So on the face of it, the garden’s biodiverse space is so compact that some people may think ‘they were mad to bother putting it in’. 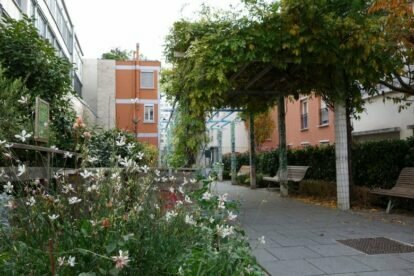 How to describe the Grands Voisins, a place that changes every time I visit it? Although it is hard to list everything that is going on there, I will give it a try. Les Grands Voisins is a social project, located in an abandoned hospital. It brings together social housing, NGOs, artists and more and more Parisians, because what once started as an underground venue has been attracting an ever-larger audience. When you enter the area it feels like you’ve left Paris behind and have entered Berlin (or so I imagine). Its spacious and somewhat neglected buildings are decorated with self-made art. Most of the buildings are reserved for housing women, young adults, and immigrant workers – adding up to 600 persons in total. Just next to that you will find artists doing their job and various people having outdoor meetings. Do not hesitate to talk with the people here: all the people I talked to were very happy to tell me about their work.